Its already been two whole weeks?! No seriously, its been two weeks since I've moved into my new apartment. There are boxes everywhere still, and Chris doesn't get in until tonight so we'll still have to unpack all of his things. On the bright side though, the kitchen is unpacked & organized, the living room is how we like it, and the dining room is coming along nicely! We went grocery shopping the other day and got food for the week. I think this week I'm going to bring back the Tuesday staple of Taco Tuesday. So basically, my rooms craziness is contained to just my room and I still haven't attempted to start my closet yet. AND I FINALLY HAVE WIFI. So here's the story. I have to say, dealing with any cable company is pure hell. I ordered my internet online, and chose the option to install it myself. Its not hard to install an ethernet cable, a phone line, and a power cord. Needless to say, it didn't work. So I called the next day (Wednesday) and was told a technician would be there from 4-8pm. Guess what, they never showed. 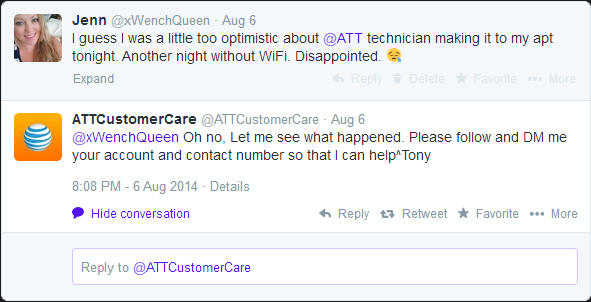 My roommate and I were irritated, so late that night I tweeted at @ATT. And guess what, they RESPONDED. I followed and DM'd and he called me, checked why no one showed up at my apartment, and realized that there was no reason why my job shouldn't of been done. And made sure I would be seen that day from 4-8pm. And sure enough, at 3:30pm I was contacted by someone who said they would be there in 20mins. So I drove home quickly, only for the guy who was supposed to be there in 20mins never to show up. Over an hour later I get a phone call from someone else saying that he would be taking care of me and would be there in 15 (as he was just across the street). This guy (Justen) actually showed up! And then we actually found out that the previous guy had been in an accident. Justen realized the problem and fixed it quickly. My roomie and I watched an episode of Serial Experiments Lain while he fixed everything. When he had everything set up he helped us with the walkthrough and then suggested what looks to be an awesome Netflix series called Hemlock Grove. We're going to be watching that for sure. If you've had a good (or bad) experience with the cable company let me know in the comments below!